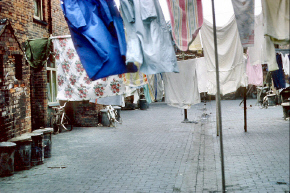 Phyllis Nicklin (1913? 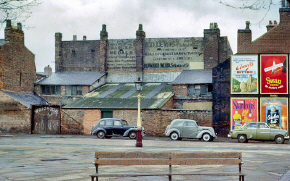 – 1969) ‘s wonderful colour slide-photography of the 1950s and early 1960s in central Birmingham, made as documentation for her geography students. Many more here; although apparently only a small selection of the 450 scans placed online in 2004/5 by the ‘Chrysalis’ digitisation project of the West Midlands Museums, Libraries and Archives Council. The ‘Chrysalis’ website is now firmly defunct, and so this is all that’s left of her work online. Presumably the funding ran out. “Professionals built the Titanic, amateurs built Noah’s Ark” is a phrase that comes to mind. There’s no book, and there doesn’t appear to have ever been an exhibition. Where exactly are the original slides being kept? A Google search for [ “Phyllis Nicklin” archive ] comes up blank. 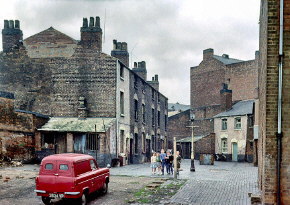 As does [ “Phyllis Nicklin” collection ]. Anyway; Nicklin even photographed the street in which my family business was located from about 1900 until sometime in the 1930s — this is the first time we’ve had a photo of the place.